Beef and barley are a match made in culinary heaven! Here, this hearty combo fills bell peppers for a hearty Southwestern-inspired meal! I’ve been posting a lot of veggie-centric recipes lately and I love to eat that way. I don’t think I’ve met a vegetable yet I don’t like! 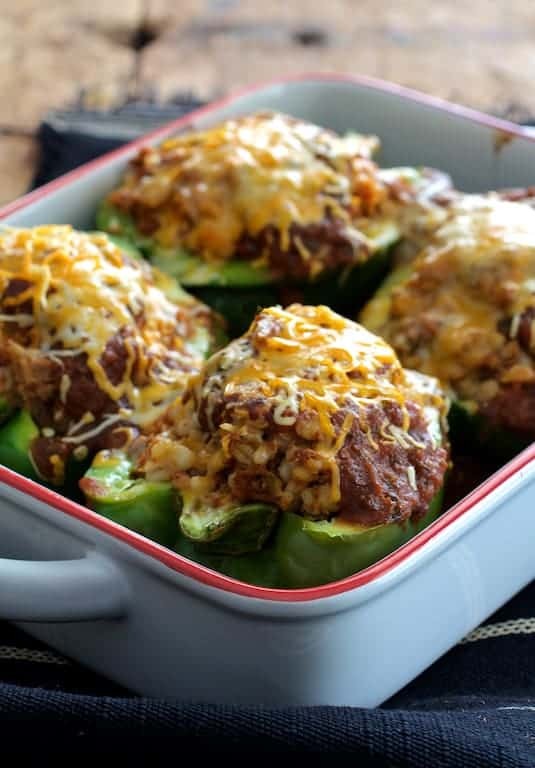 However, sometimes a person just needs something hearty and beefy for comfort–like these Southwestern Beef and Barley Stuffed Bell Peppers–complete with a blanket of cheese! Stuffed bell peppers are something I actually crave; I have to make them at least once or twice during the fall and winter. They are simply wonderful because although they take a little time to prep, this can all be done ahead of time and baked prior to serving. 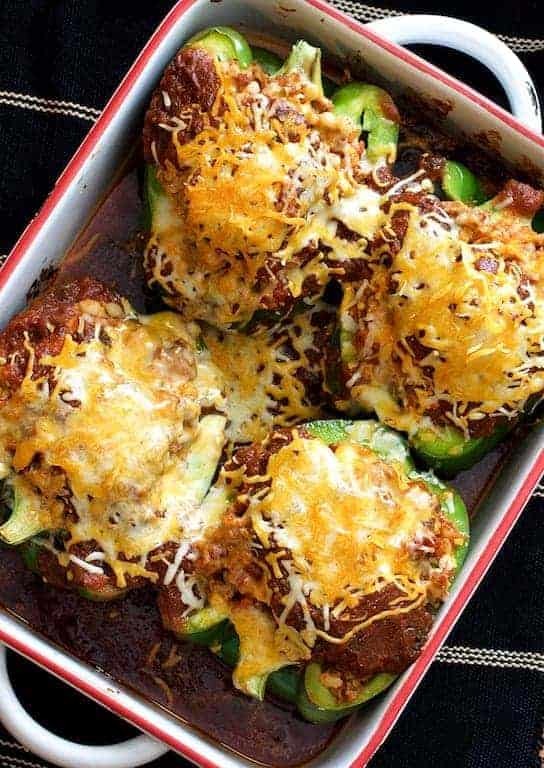 Make sure your ground beef is super fresh and don’t go longer than a day without baking the peppers as raw ground beef becomes hazardous quickly. When cooked through, stuffed bell peppers reheat and freeze beautifully, too! I used barley instead of traditional rice because beef and barley pair so well together. I especially love barley for the wonderful toothsome texture when it’s cooked properly. Bell peppers contain a fair amount of water which can make the filling soupy so you need to extract some of that water. Microwaving briefly works, however, I like to roast them briefly before filling. Let the peppers cool and simply pour the liquid that accumulated in the bottom out. Make these gluten-free by substituting rice or quinoa for the barley and healthier by using super-lean ground beef, ground turkey or ground chicken. Use half the cheese or a 2% cheese to lighten them some more. Whether these serve six or eight will depend upon appetite. I’m good with one pepper, but my hubby can easily eat two. 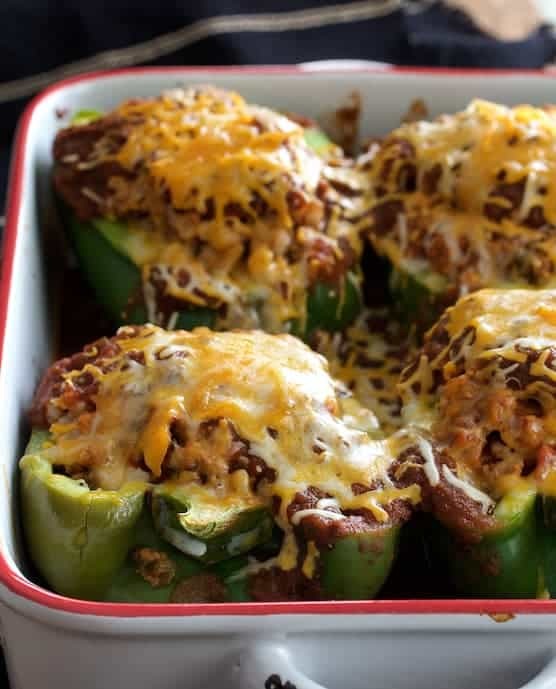 Because stuffed bell peppers are so hearty, you don’t need much more on the side. A salad is perfect! Beef and barley are a match made in culinary heaven! They're delicious together in these Southwestern-inspired stuffed bell peppers. Place peppers in an oiled baking dish and bake for 20 minutes. Let cool and pour out any water that accumulated in the bottom of the pepper. Meanwhile, bring a small pot of water to a boil. Add salt to taste and add barley. Cook until al dente (tender but with some bite). Drain, rinse with cold water, drain again and set aside. Heat 2 tablespoons oil in a skillet or saute pan. Add the onion and cook 7-8 minutes or until softened. Add garlic, chili powder, cumin, coriander, oregano and cayenne pepper. Stir, then add tomato sauce and beef broth. Bring to a boil, reduce heat and simmer 5 minutes or until thickened slightly. Season to taste with salt and black pepper. Transfer 1 cup of the sauce to a large bowl and let cool. Add the barley, beef, egg, 1 cup cheese and mix well. Fill peppers with equal amounts of the filling. Pour sauce over the peppers, cover with foil and bake 40-45 minutes or until cooked through to 165 degrees in the center. Top with cheese, return to the oven and bake another 10 minutes or until cheese has melted. MAKE AHEAD: Assemble and refrigerate up to 1 day ahead. Increase baking time if cold from the refrigerator. FREEZER-FRIENDLY: After baking, cool thoroughly and freeze in smaller portions. Thaw in the refrigerator and reheat in the oven. Hi, Margo! Thanks so much and so glad you enjoyed! That salad with the peppers sounds perfect! Yum! Made these tonight and it was delicious. Barley is a better pairing than rice and as carbs go, barley is a beneficial one. Hubby wants me to use this filling in the summer to stuff yellow squash, too. Thank you Carol for sharing this. 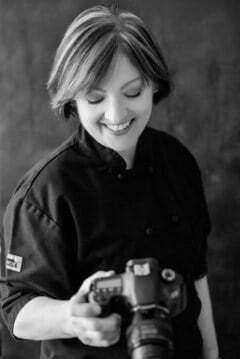 Hi, Teresa, Thanks so much for your comment and glad you enjoyed! I know what you mean about the barley; I love the toothsome texture. Rice tends to get lost a little bit. Thanks again and please stay in touch! Hi Carol – thanks for sharing this. The melted cheese on top make them more delicious. Can’t wait to try this! Thanks, Jeff! This Wisconsin girl HAS to have cheese now and then! These look and sound delicious Carol. I feel the same way about eating mostly veggies and then going all out with a meaty cheesy splurge!